Eagle-Gryphon Games is doing a double over on Kickstarter, running a campaign for two games at once. 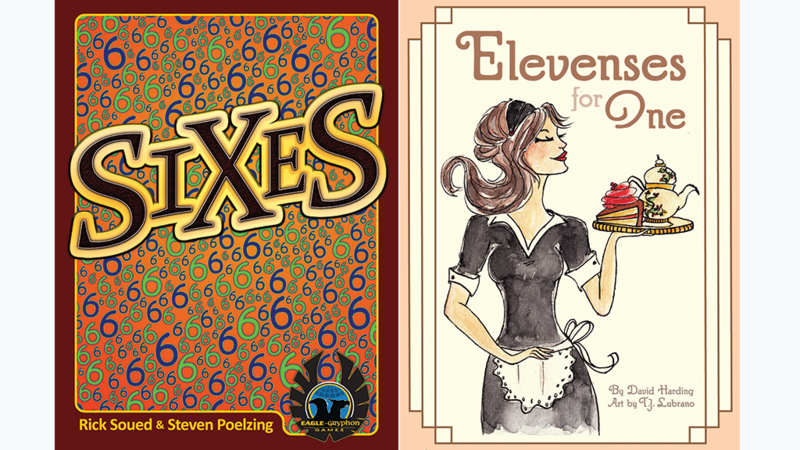 There's SiXeS and Elevenses for One, great for whether you're involved with a whole group of people or just enjoying a game by yourself. SiXeS is a party game for 4 to 40 people where you come up with six items that fit into one category, while coming up with one thing that fits into six categories. Over the course of six rounds (noticing a theme? ), the player/team that scores the highest is the winner. Meanwhile, in Elevenses for One, you're trying to arrange a tea trolley before 11am (I'm sensing a theme here, too). There's 11 tea cards you have to arrange on the cart. Each one has a special ability to help you beat the timer. Each game is just $9. They've already made it over their funding goal, so it's on to stretch goals for the next 19 days.